Credit is ever so personal, and ultimately it's your responsibility -- but maybe this time, it's not solely about you. Where you live matters: Your state's creditworthiness can impact you too. 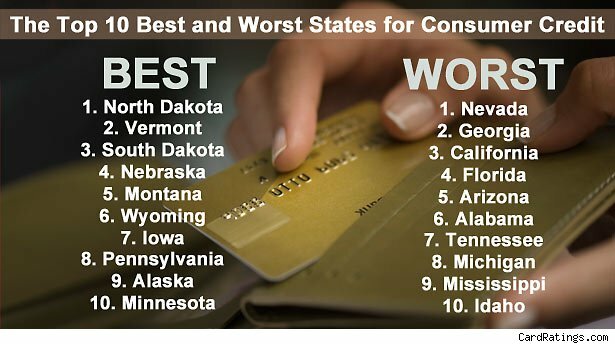 For that reason, CardRatings.com's recently released rankings of the 10 Best and Worst States for Consumer Credit is worth a look-see. To figure out which states deserved kudos and which got thumbs down, CardRatings.com analyzed indicators directly related to individual credit usage and repayment behavior, such as average credit score, credit card delinquency rates and home foreclosure rates. It also charted big picture factors like unemployment and personal bankruptcy issues. The five criteria included: average credit score (Experian, June 2011); foreclosure rates (RealtyTrac, May 2011); credit card delinquency rates (TransUnion, Q1 2011); unemployment rates (Bureau of Labor Statistics, May 2011), and bankruptcy rates (American Bankruptcy Institute, Q1 2011). What's the 411 on the top 10? "Low unemployment rates seem to be a common thread," says Curtis Arnold, founder of CardRatings.com. No surprise here, as foreclosure and delinquency rates tend to historically mirror unemployment rates." As for top dog North Dakota, "the financial health of this state has largely flown under the radar, and N.D. is obviously a best kept secret," he says. The bottom dwellers, by contrast, share high bankruptcy and/or foreclosure rates. The causes vary, but the end results are similar and all are financially devastating, says Arnold. Which state was the most surprising to find in the lowest tier? "Idaho," says Arnold. "I think many people would assume that Idaho is fairly conservative when it comes to lifestyle and spending issues." "I think the implications for everyone in the states listed [in the bottom tier] is significant, regardless of whether you personally have good or bad credit," says Arnold. If you have the misfortune of living in a state with less than stellar credit, realize that this could mean that lenders on your home turf are ailing, which therefore may limit the type and quality of financial services available to you. Secondly, financial institutions outside your state may look askance at you if you live in a place where people have a poor track record of making timely payments. 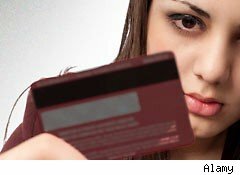 Truth is, even if you've been a good credit citizen, if you live in a place where your neighbors have committed all sorts of credit sins, it can touch you too. "Lenders may have stronger underwriting standards in states in the "Worst Of" list or vice versa. Like it or not, this can affect the availability of credit for all residents," says Arnold. If you're in a low ranking state, there only one thing you can do -- other than saying adios. "Be a proponent for financial literacy in your area," says Arnold. "This can and does make a difference over time."